As busy as life is, I still make time to cook – well I have to with the twins allergies. Sometimes I wish I could just get takeout but then I think what a blessing it is that my whole family eats wholesome foods and we are so much healthier because of it. It just takes a little more organization on my part, it’s a good thing I am a planner. Because I don’t really have that simple luxury of picking up something for dinner I make extra of a dish then freeze half of it. This is one of my “freezes well” recipes, which also can be made a few days in advance and still taste like you just prepared it. 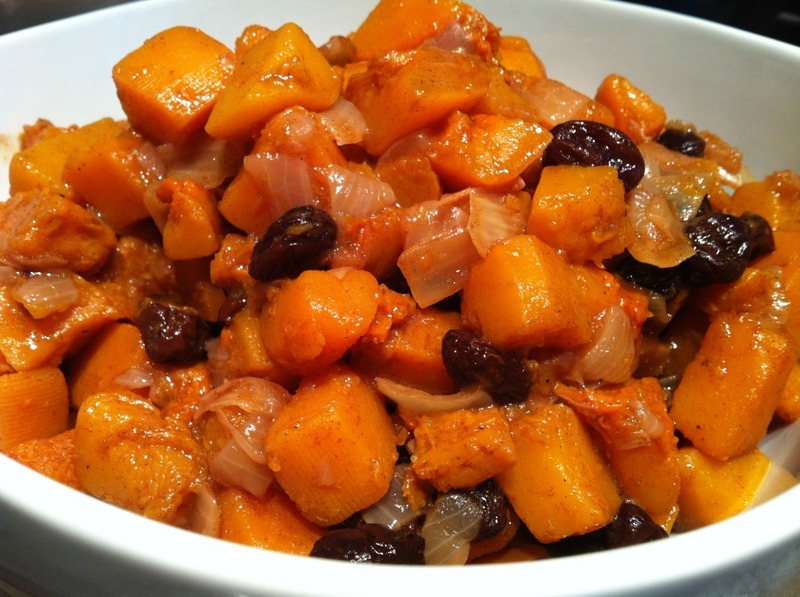 It’s a simple yet delicious recipe featuring the sweet flavor of butternut squash. I LOVE squash, all squashes. I usually make this for Thanksgiving as a staple side dish but I can’t wait until the end of November to bust out this recipe. It’s my comfort food. Sorry mashed potatoes, you have been overshadowed. Sometimes I switch out the raisins for unsweetened dried cranberries or dried prunes if I run out of raisins. It’s so versatile. You can use any dried fruit you like. 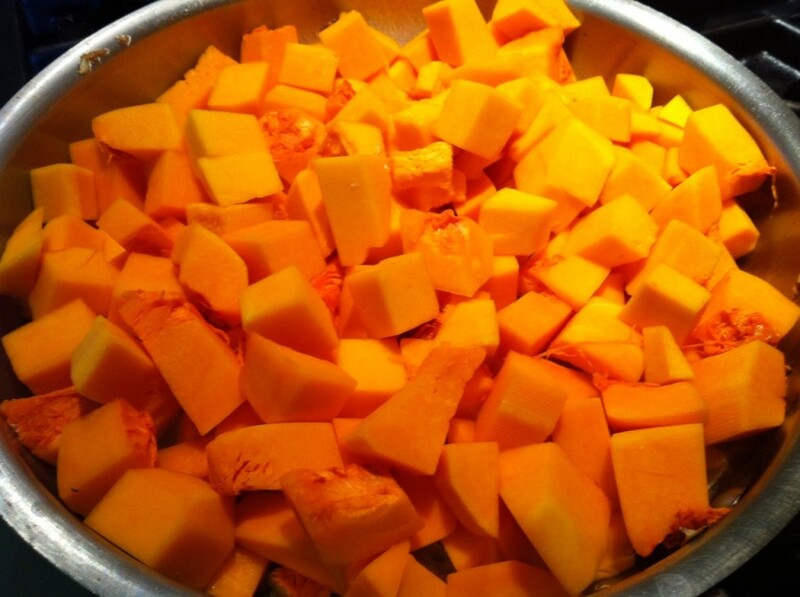 And you know I love how nutritious squash is; with all that Vitamin A, Vitamin C, Fiber, and anti-oxidants! This recipe is from my Mom, she would always make a huge skillet full due to the high demand. I remember the aroma of sweet cinnamon squash lingering up the stairs calling my name. There is nothing like filling the air with the aroma of great food to share with family and friends over great conversation. Isn’t that what life is about? 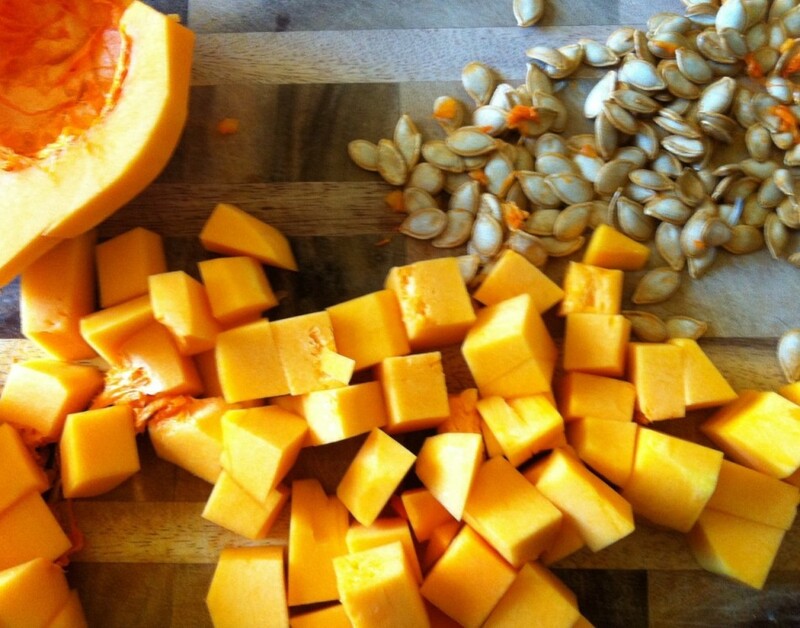 Note: Squash seeds are just as delicious as pumpkin seeds just smaller so don’t throw them away. Roast seeds on a parchment lined baking sheet in a 400 degrees F oven for 20 minutes with a sprinkling of kosher salt. So good! Tip: I roast the seeds the same time I roast my vegetables to utilize the oven as much as I can. All my roasting of vegetables is done at the same temperature so it works out perfectly. In a large heavy bottomed skillet set on medium high heat, add oil and margarine. 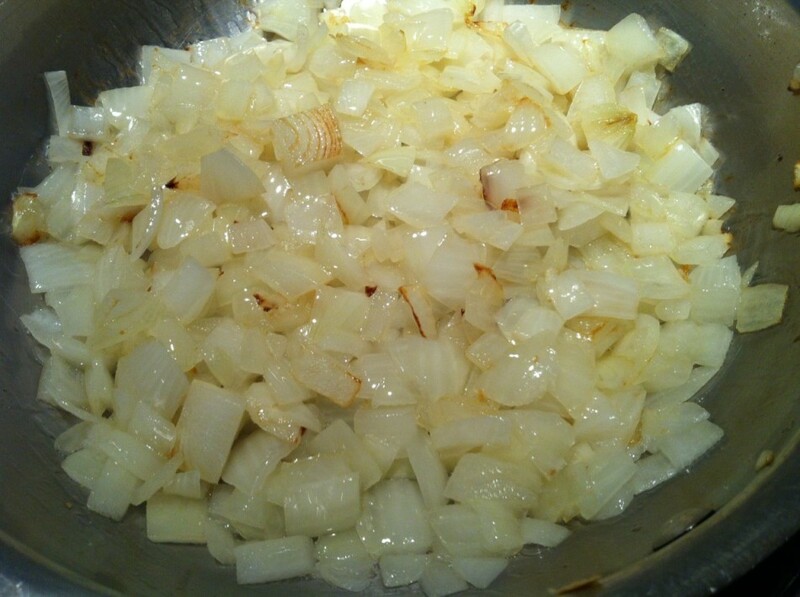 Add onion, and salt, stir. Meanwhile, soak raisins in a cup of very hot water. Set aside to plump up for 10 minutes. 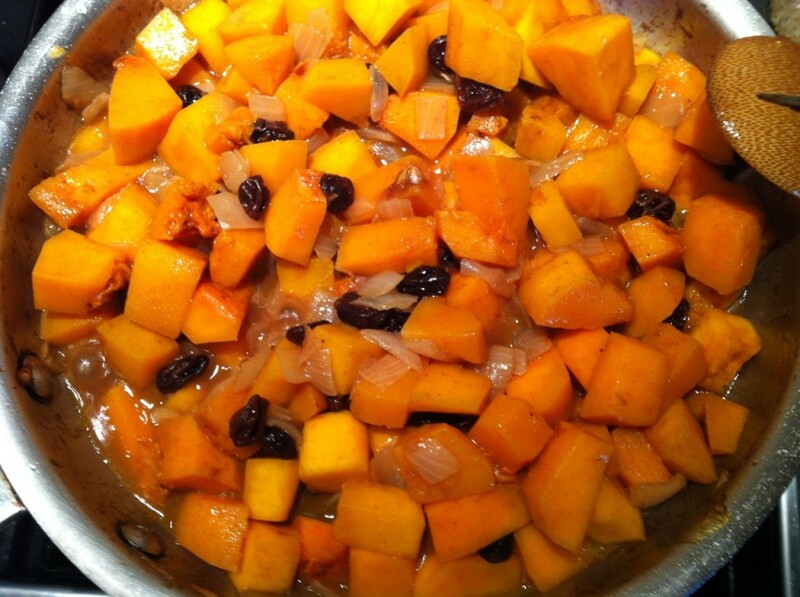 When onions have some brown bits on them add diced butternut squash. Add cinnamon and nutmeg, combine well with the onions. Continue to stir occasionally. 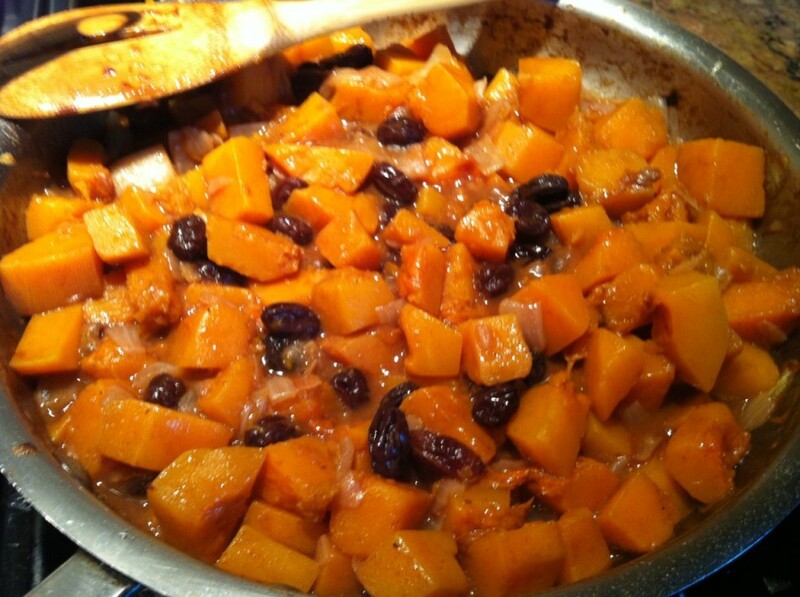 When squash has begun to soften (2-3 minutes) add the drained raisins, stir. Add xylitol and agave nectar (I use xylitol to reduce sugar and the agave to caramelize the squash, you can use all agave if you prefer). Toss to combine well. Add vegetable stock. Stir again. After a few minutes the stock will reduce by half, then cover the pan and reduce heat to medium. Cook for another 10 minutes or so until the stock has been absorbed. **If freezing: Let it cool first then store in an airtight container. Will freeze well for 2 months. This looks sooo good. I never thought to add soaked raisins, that's usually not indicated in a recipe. Makes sense not add hard dried raisins. I look forward to making this for the holiday. Yum! This looks so delicious as a Thanksgiving side dish. Simple enough for someone like who doesn't cook much. I also have my eye on your no bake pumpkin cheesecake. 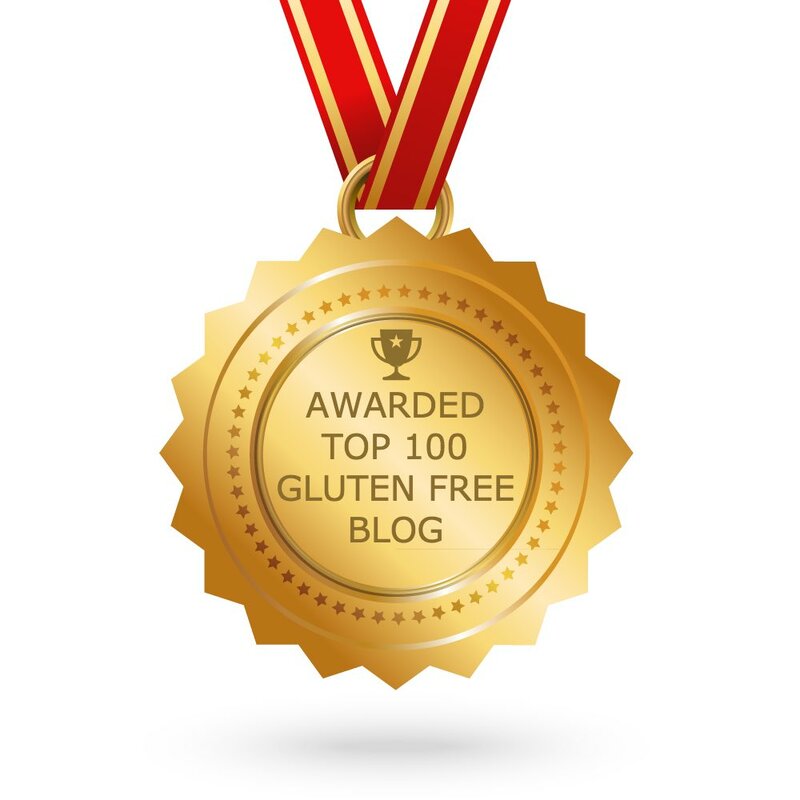 SO glad I found your blog. Your photos looks so natural and everything looks super yummy!